Nancy Rubins, Our Friend Fluid Metal, 2014, aluminium, stainless steel, 17' x 51 1/2“ x 23 1/2”. 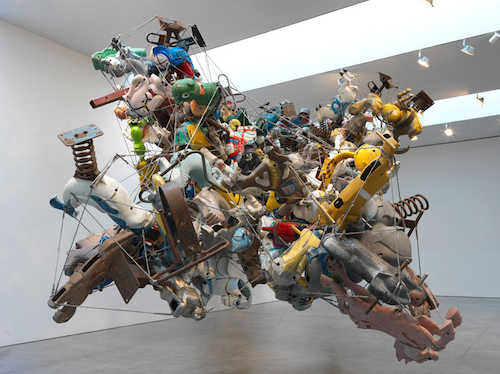 Nancy Rubins is known for her large public works composed of airplane parts, boats, televisions, mattresses, and other detritus mined from the boneyards of industrialized consumerism. Here she presents four sculptures formed from conglomerations of aluminum animals typical of fairground rides and children’s playgrounds—horses, ducks, and elephants among them—tightly bound together by wire cables. Three floor-based works rise from pedestals, expanding into multicolored cornucopias, while the largest piece, Our Friend Fluid Metal, 2014, also the name of the exhibition, emerges from a wall like zoological ectoplasm, billowing into the room above the viewer. The brightly painted expressions of Rubins’s infantilized animals were once perhaps intended to augment the rider’s carnival experience, but with their redundancy, the paralyzed smiles and battered carcasses evoke hollow bewilderment rather than warm nostalgia, so that these works function as funereal totems to long-gone childhood pleasures. While lacking the volume to inspire awe, or many of the other superlatives commonly applied to Rubins’s work, the sculptures do possess density and mass—qualities which strike an ominous tone. The creatures are so pitifully compressed and restricted in their suspended cages that they become not only a representation of detachment from youthful freedoms, but also a conduit for notions of seizure and abuse, relating less to animals than to the materials that Rubins’s menageries are made of. Although these structures are built from reconstituted metals, the greater suggestion is of a Benjamin Button–like societal regression should we continue to plunder and discard our finite resources.